Egypt's security forces have increased their security presence in North Sinai's Al-Arish following an attack on Tuesday against a pipeline that carries gas to Jordan, the 27th such attack since 2011. Security forces have closed the entrances and exits of Al-Arish in search of the assailants, state news agency MENA reported. No one has claimed responsibility for the attack yet, however, Egypt's most violent militant group, Sinai-based Ansar Beit Al-Maqdis (ABM), have repeatedly claimed previous attacks on the gas pipeline. In November, ABM announced their allegiance to Islamic State (IS), a militant group that has seized large parts of Iraq and Syria. In a video released by ABM in November, the group showed a scene blasting the pipeline, while a note scrolls across the bottom, announcing that Jordan had joined the war against IS. "God willing, not a drop of gas will reach Jordan until the caliph [of IS] permits it," another caption read. 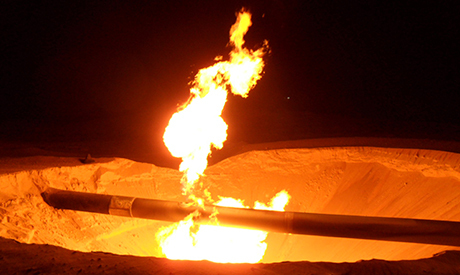 Targeting the pipeline has repeatedly forced a halt to gas exports to Jordan and Israel, the latter of which Egypt used to supply until April 2013. Egypt’s army has been facing a decade-long jihadist militant insurgency in the Sinai Peninsula, with militant attacks increasing over the past year and expanding into Cairo and the Nile Delta, killing hundreds of army and police personnel. The military has also announced killing and arresting hundreds of militants. The deadliest attack to date was on 24 October, when militants killed 31 army personnel and injured at least 30 others in a single car bomb attack in North Sinai. An overnight curfew has been imposed after the attack, as well as a buffer zone, one kilometre wide and 14 kilometres long, near the border areas of Rafah and Sheikh Zuweyid. Houses in these areas have been evacuated and their inhabitants compensated.